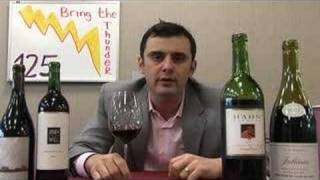 Wine Library TV | Tensley and Vaynerchuk Talk About Parker, Syrah and Wine. Today Gary welcomes his special guest Joey Tensley of Tensley Wines. Gary tastes three of his wines and the two discuss ratings and wine making. Joey Heatherton without a doubt!! Then Dallas Cowboy Lance Renfro screwed that up!! Why do none of Gary’s guests have access to the spit bucket? He is over there filling it up, and these guys and swallowing their goods. No wonder they are all so agreeable by the end of the espidose? Tried the Tinsley and agree with you that it is not for those who seek more balance and elegance. I found it a jammy fruit bomb. Also was similarly disappointed in the Dom. La Garrique Vacqueyras 2004. Lovely color, lots of nice, dark fruit, but very fleshy. Nothing else going on, little complexity, little “garrique” in the garrique to balance the 15% alc. Found the 2004 Dom. Montvac Vacqueyras much more to my liking. Cedar and sage complimenting the fruit. Enjoyed meeting you at the store! Keep up the good work. I just started working p/t at Total Wine. LoL… that sly close-up of the Jets Spit Bucket was money. Joe was awesome. You should definitely have him back! QOTD – I guess taking the name literally, wrestling announcer Joey Styles. But using any derivation of Joey, it has to be the greatest musical genius of all time (IMHO), Johann Sebastian Bach. That late harvest Syrah tasting literally had me salivating the whole time. I hope to try that wine out someday, it sounded wonderful. I think it could have been made into a heavenly port-styled wine too. Somehow I felt Gary’s 94 point score was deliberately understated. 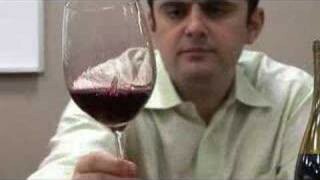 Gary how about a vin jaune episode or tackling a one aon tasting different charbono’s?